In 8-inch skillet, cook sausage over medium heat, stirring occasionally, until no longer pink; drain if necessary. Cool. Meanwhile, place flank steaks between pieces of plastic wrap or cooking parchment paper; gently pound with flat side of meat mallet until steaks are rectangular and about 1/4 inch thick. Arrange 3 to 4 prosciutto slices on each steak, covering surface. Add stuffing, parsley, cheese and egg to sausage in skillet; stir well. Spoon evenly over prosciutto on each steak, leaving 1/4-inch border on all sides. Starting at a long side, roll up 1 steak, tucking in ends to enclose stuffing; secure with kitchen string in 2 or 3 places. Repeat with second steak. Spray 5-quart slow cooker with cooking spray. Place steak rolls, seam sides down, in slow cooker. Sprinkle dried minced garlic over steak rolls; spoon pasta sauce over garlic. Carefully remove steak rolls; clip and discard string. Slice meat crosswise into pieces. 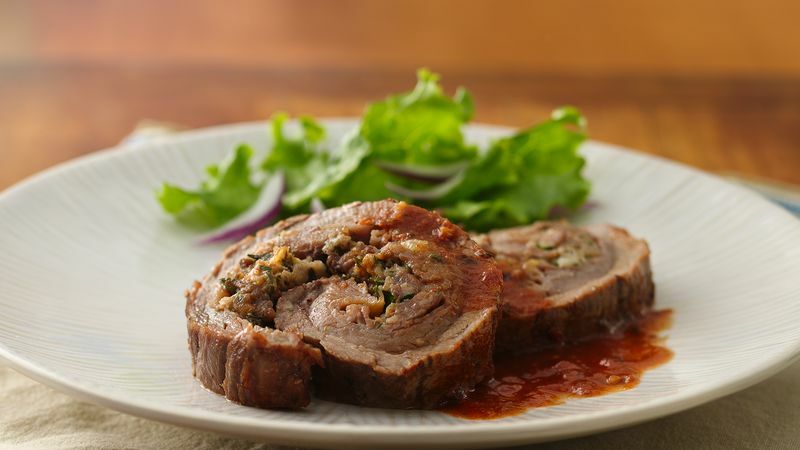 Serve with sauce from slow cooker. When pounding the meat in this recipe, you use the flat side of the meat mallet since you are pounding it to make it thinner, not trying to tenderize the meat. Do you have homemade or leftover marinara sauce? If so, substitute 1 3/4 cups for the jar of pasta sauce in this recipe.